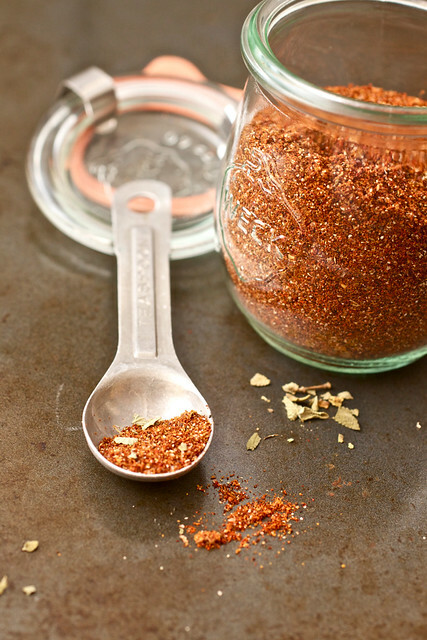 A homemade taco seasoning without packaged preservatives and artificial ingredients. Make your own in just 5 minutes with regular pantry ingredients and keep it on hand for when Taco Tuesdays roll around! After posting about my taco night dinner plans on Facebook this week, I guess I had forgotten how much people love tacos. Of the 9 people who responded to my question, 4 of them were also having tacos that night. Is it safe to assume that an exponential number of people in the U.S. eat tacos on any given night for dinner? Are you eating tacos? OK so because I’m writing this post, I’m going to assume that you are eating tacos at some point so my bigger question should be, how are you making them? There are of course, enough versions of tacos to come out of my ears but our most basic and favorite are the traditional American tacos grew up on…except now we use ground turkey breast instead of ground beef. (I won that battle.) Browned meat with taco seasoning (formerly from a packet), diced up fresh tomatoes, a mound of leafy green lettuce, shredded Monterrey jack and/or sharp cheddar cheese, a powerful hit of red onions, and a few dollops of cool heaven…errhmm…sour cream are what you’ll find in our house on taco night. As far as the vessel goes, we’re split – Kyle loves crunchy corn taco shells while I lean more towards high-fiber flour tortillas. But what really makes tacos tacos is the seasoning and up until 2 or 3 years ago, we were using the packets from the spice aisle at the grocery store when I actually looked at the sodium content on the package and almost had a figurative stroke. We immediately switched over to a salt-free mix from Penzeys which was ok but it was missing something – ummm, salt – and I found that I was just adding too much to achieve the right taste. This taco seasoning recipe was conveniently attached to the creamy taco mac that we adore and it was only natural for us to use the seasoning on regular tacos since the taco mac is such a big hit around here. The recipe below yields enough for four batches of tacos (using 1lb ground meat per batch) but you can easily double or triple the amounts to save yourself some time in the future. You can find all of the ingredients in your local grocery store but I highly recommend checking out places like Penzeys or The Spice House to arm yourself with larger quantities at much lower prices than you’ll find in the grocery store. Combine all ingredients in a small jar or airtight container. 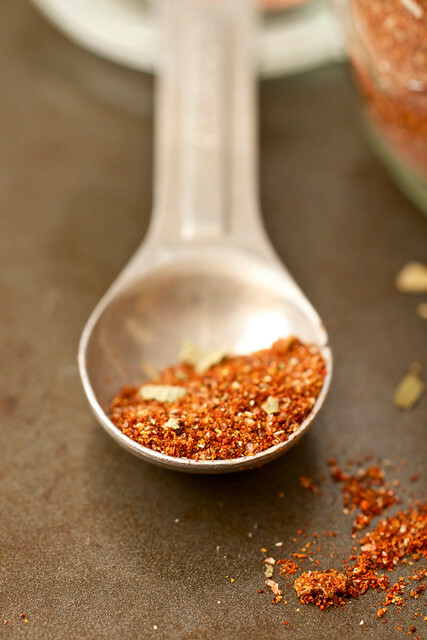 To use: Use 2 to 2 ½ tablespoons of taco seasoning in place of a packet of store-bought taco seasoning. Combine 2 tablespoons cornstarch with 1 cup cold water and stir to dissolve cornstarch. In a large saute pan set over medium-high heat, brown 1lb ground beef, turkey or chicken, add seasoning and cornstarch-water mixture, and simmer over low heat until liquid has thickened. What a great idea!!! These would make cute little gifts as well. Definitely will be making! I love making my own taco seasoning. I can reduce the sodium content compared to store-bought packages and it’s so easy to make! It is such a great idea to make a big batch of this to always have on hand. I usually season my tacos with my own spices but making one big batch would speed up prep time on taco night! Taco’s…yum! We had Tostada’s tonight, that is kind of like tacos. I have never made my own seasoning, not sure why. This looks great! Can’t wait to try it! Just made a batch of tacos last night using those overpriced packets. I’m filing your version away to use next time. Thanks for the post! Definitely a good blend to have on hand. Your photos are awesome too! Great recipe! I used it to make tacos tonight and they were the best homemade tacos I’ve ever had! Thanks for this! I’ve been wanting to put together a better homemade taco seasoning, so this is very handy for me. Can’t wait to give it a try! love this idea! where did you get the cool container? thank you thank you… I was looking for a taco seasoning that would be “Dan Safe” (my nephew who’s allergic to so many things) and I think I found it!!! Yes! Where did you get the little spice jar? Amanda: The jar is made by Weck. Sounds awesome – I live overseas and there’s a severe lack of good Mexican food around here. Just a question – is there any reason why you couldn’t add the cornstarch to the mixture and store it – just adding water when you’re ready to cook? Curious: I’ve thought about adding the cornstarch to the spice mix but I just haven’t done it before. If you try it, let me know how it works out! What is the cornstarch for? Is that already in the packaged mix? I’m definitely going to try this mix! Katherine: The cornstarch will help to thicken the taco sauce. I’m not sure if cornstarch specifically is in packaged mixes but they do include some sort of thickener. this came out perfect!! thank you. I have been making my own taxi seasoning for a few months now,one bc of the salt content but mostly bc if you look, they slop have MSG which is where the high salt content actually comes from… I have had to go to mostly making my own seasonings bc most have msg, or even some basic things like yellow rice too, anyways may I suggest something in place of the cornstarch and water..I actually got this from my mother in law who surprisingly has to have a recipe for everything but veered a little in one and uses tomato sauce instead of just plain water, it gives you the thickness that you need and get w cornstarch but more flavor. I also will add in a tiny bit of salsa and have been putting in red or black beans or both. Also instead of ground turkey, try ground chicken breast, make sure its not the pursue ground chicken, as that is a mix of all the pieces, if you can, get your butcher or meat market or grocer to ground up boneless, skinless breasts, I have replaced almost all of my ground beef with ground chicken. I however still occassionally need the red meat as my blood type requires me to eat plenty of red meat to get my iron and protein. You can always do a half and half as well…which gives it a whole diff flavor. We had tacos last night and my taco seasoning mix is nearly the same as yours. I haven’t tried red pepper flakes in it before but it sounds like a good addition. I also don’t use cornstarch. I have a child who does not like spicy food but loves good flavor. How spicy is this recipe? Thanks! Melissa: It isn’t all that spicy since ancho chile powder tends to be less spicy than regular chili powder. I would start out with a little less seasoning than the recipe calls for, taste, then adjust as you see fit. Alternatively you can increase the amounts of the other spices and reduce the ancho chile powder. It’s a really adaptable recipe for your family’s tastes. Hope that helps! my question is how long would this last in the pantry? Not that I see it lasting long, but if I made a large amount what time frame should be used? Faith: At least a few months. Is there anything you can do besides corn starch? My son is allergic to corn. Could you just use this on the meat? Rachel: Yes, you could leave out the cornstarch. I use it to thicken the mixture but it isn’t necessary. Alternatively, while I haven’t used it, I understand you could use arrow root as a thickener. I don’t believe it is a corn-based product and you can likely find it in your grocery store near the cornstarch – just check the label (as if you don’t do that already. 🙂 Hope that helps! A tablespoon or two of tomato paste works great as well as a thickener and adds flavor. I was searching the internet for taco seasoning recipes and came across yours. It sounds perfect. Much better than some of the other ones I’ve come across. I’m going to give it a try sometime this week. Thanks for sharing it. ha we had tacos last night for dinner. We have them, at least once a week. Just made it today and loved it! Thanks much! Thank you so much for this! I found it via Pinterest. Perfect timing since I was just put on a yeast free diet, and taco seasoning packets contain just that. I couldn’t live without tacos! I’m sorry to hear about your new yeast restriction but I’m glad this recipe will keep you in the taco game! I actually just made a double batch this morning before work and I can’t wait for dinner tonight! Yes, the amount is correct. If you felt like 2 teaspoons were enough, nobody would argue with you.